The two-year-old is asleep, so I have to pop out a wine review, before the moment slips. For Thanksgiving, something supple, medium bodied, mildly tannic but with good acidity to keep the food coming. It is a worthwhile moment to share an aged wine and something American. Lucky us, a beer friend offloaded his 2003 Pinot Noir by Lange from the Cancilla Vineyard in the Willamette Valley of Oregon. The APPEARANCE looks a medium intense garnet with a medium clear rim, casual lean legs, and a touch of sediment. AROMAS glow of medium intense honey, dried orange peel, black cherry paste, strawberry, brooding clove and nutmeg powder. The PALATE seems rich, thanks to a thick velvet texture, but is medium in body, silky smooth for two thirds until a twang and tannic finish. FLAVORS still hold pleasantly fresh and complex, with black fruits akin to dark cherry and blackberry, light cigar ash, iron flecks, wrapped in a mellow honey of medium plus length. Fresh into the glass, Lange’s 2003 holds well and is outstanding (5 of 5) for its age. However, do not forget it. As each hour passes that fruit falls out, inch by inch. By the end of a meal it is a shadow. Nice work for the holiday. Mom and kiddo soak in the sunshine. But after milling for hours through the throng and flora at Butchart Gardens, you could use a drink. Luckily, a mere six minute drive will get you to De Vine Vineyards (an easy 22 minutes from Victoria). So we take the narrow drive up a hill, and yes, pass real vineyards. These grow normal, everyday grapes like Pinot Gris and Grüner Veltliner. A chunk get made into spirits, but more on that later. Our core question: can De Vine buck the brutal acid and imbalance of other Vancouver Island wines. To the tasting room! The diligent staff fill me in. Winemaker, Ken Winchester, a Montreal native, left his garage winemaking, studied at UC Davis, built 15 acre Winchester Vineyards in Paso Robles and saw decades of success. He also studied distilling at Islay Scotch icon Bruichladdich. But in 2002, he returned to the cold climes of Vancouver BC, and soon came under the wing of the Windsor family and their De Vine Vineyards. It looks like pale lemon water. Yet aromas pounce with enough lychee, citrus, star gazer lily and tropical tones to remind of its Gewurztramier heritage. But do not let the nose fool you. The palate feels near dry, clean, with ample but tame acidity, and medium body, with some viscosity. Flavors range from snappy Granny Smith apple, lime, and white pear. Dev Vine’s Siegerrebe is a very good (4 of 5) white ready for summer or various light dishes. This is not your plump, sweet yet vapid Italian Pinot Grigio. No. Twangy aromas and flavors run from peach to oodles of lemon lime and salt. It feels lean taught and steely. If your enamel can handle it, De Vine’s Pinot Gris is very good (4 of 5). Fleur White Blend 2017 $22 comes from upland Alsatian grapes: Maeline Sylvaner, Pinot Auxerrois and Schönburger. It looks watery pale. Honestly, it tastes sweet, yeasty, underdeveloped, but rounder and more approachable than otherwise. It is acceptable (2 of 5) but clearly compensating. We already pitted De Vine’s 2017 Pinot Noir against other island Pinots (read here). Long story short, $28 gets you a bright, soft, bubblegum, berry and earth, quaffable but forgettable red (3 of 5) thanks to carbonic macerated grapes akin to Beaujolais Nouveau style. Wait, who? No your not in Napa anymore, Toto. Marechal Foch, named for the synonymous marshal who ended WWI. I have not seen this funny Alsatian hybrid since living in Upstate New York and Nova Scotia (read here). The appearance is a purple ink. Flavors and aromas glow with blackberry compote, red cherry, medium acidity and well integrated muscular grippy tannins. 18 months in French oak barrels gives it a tobacco mocha that level up the quality to very good (4 of 5), worthy of a bottle purchase. Look around De Vine and you quickly realize that wine only covers one side of their coin. In the lab, next to the tasting room, looms a vintage German copper pot still, named Brünhilde. Winemaker Ken Winchester also studied distilling at no slouch Islay icon Bruichladdich. Remember those vineyards. Well, Canadian law requires that they distill half of what’s grown. So that Pinot Blanc and Grüner Veltliner make it into quite a few of De Vine’s liquors. Yup, grape vodka. It tastes clean, simple, a touch edgy. Imagine if Le Croix made a new flavored sparkling water by sitting this vodka across the room while someone whispered “pinot blanc”. Their Gins are solid, especially the 1600 recipe Genever, with common (Harry Potter) household ingredients like mugwort, wormwood, horehound, and blessed thistle, all and more of which make for a plump, citric, warming, exotic nip (4 of 5 very good). We also grab a bottle of Moderna Vermouth ($22) based on a 1786, 30 botanical Turin Vermouth recipe, with its base both their wine and spirit. Neat, it tastes spicy, with pepper sticky spruce sap carrying on a long, green finish. De Vine’s Vermouth may be bit tannic but remains very good (4 of 5). 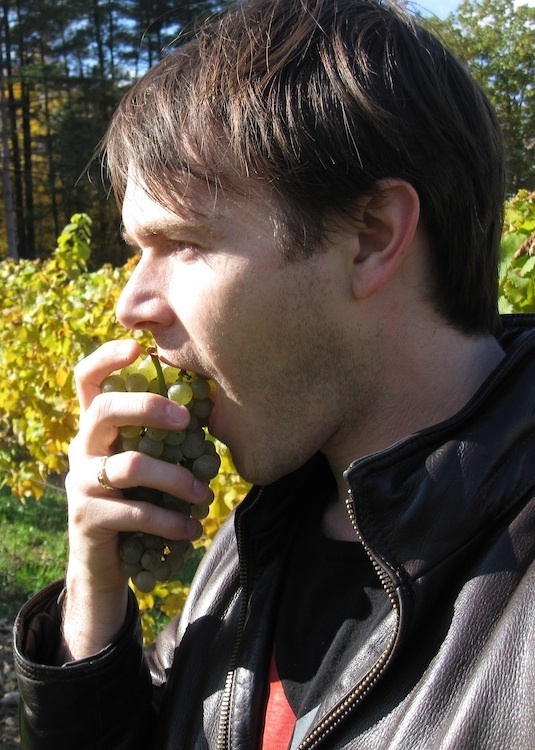 In sum, Winchester is doing his darnedest with Vancouver Island’s tart grapes, while exploring every possible spirit style at his fingertips. De Vine sits atop a lovely hilltop. They feel pleasant and polished. Their range will have something to keep any weary traveler warm. (Also, if you want to slip back into the United States, do not bore boarder guards with your list of wine purchases. The mere mention we bought Vermouth got us through two checks. Codeword: Vermouth). Maybe cool climate Burgundy and Beaujolais are not harsh enough models. Let us look to Champagne, to bubbly, to where fizz makes high acid wine magical. The winery Averill Creek is pretty big for the island: 30 planted acres. Since 2001, they do everything right, Guyot planting, warm, south facing vineyards, 2.5 tons per acre, gravity flow winery. They make a bubbly of Pinot Noir and Pinot Gris. To get the fizz, the Charmat (aka Prosecco) method keeps things young, fresh, and clean. Averill’s Charme de L’ile looks right: pale clear straw color, full of vibrant rapid medium sized bubbles. It smells promising and prosecco-like enough: clean lemon rind, grapefruit, and pale honey aromas abound. But the acidity sears off enamel and any saliva left hiding between tastebuds. A rapid, steely fizz does not help, instead it chews through any fat or protein we throw at it. Our armament of local cheeses and chips disappears decimated by all the acidity. Averill Creek’s bubbly, albeit bracing, is still a valiant effort and good (3 of 5). I imagine some time on the lees via the traditional method, or a partial malolactic ferment might make it more amiable. Still, with a few breaks between glasses, this can be enjoyed.